Deze petitie is gecreëerd door Kev b. en geeft niet per se de standpunten van de Avaaz-gemeenschap weer. Since Golden Lead Factory became operational with two massive factories in Kartong and Gunjur, things have gone absolutely wrong. 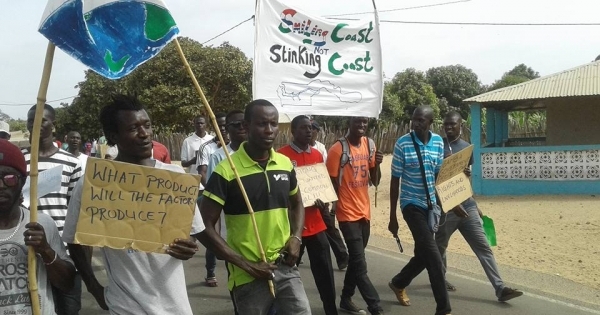 Chinese fishing trawlers have now joined forces with The Gambian fishermen. Consequently, all fishes caught are transported to the factory where they are processed into fish oil and fishmeal. The factory has made its own pipeline which transports toxic waste into the ocean. As a result, thousands of dead fish wash up shore every day. Fish stocks of snapper (red and white), captain fish and guitarfish are completely depleted. Furthermore, their waste is dumped in the nearby beaches and bushes which poses a serious health and environmental risk. Most recently, The Fenyo Bolong Wildlife Reserve has been poisoned and destroyed as a result. Golden Lead Factory is polluting our waters, overfishing our stocks and have turned our beaches into a huge cemetery. Local people from Kartong and Gunjur have started protesting and were threatened by the factory’s owners. This has to stop now! Dear President Barrow help us before it's too late!